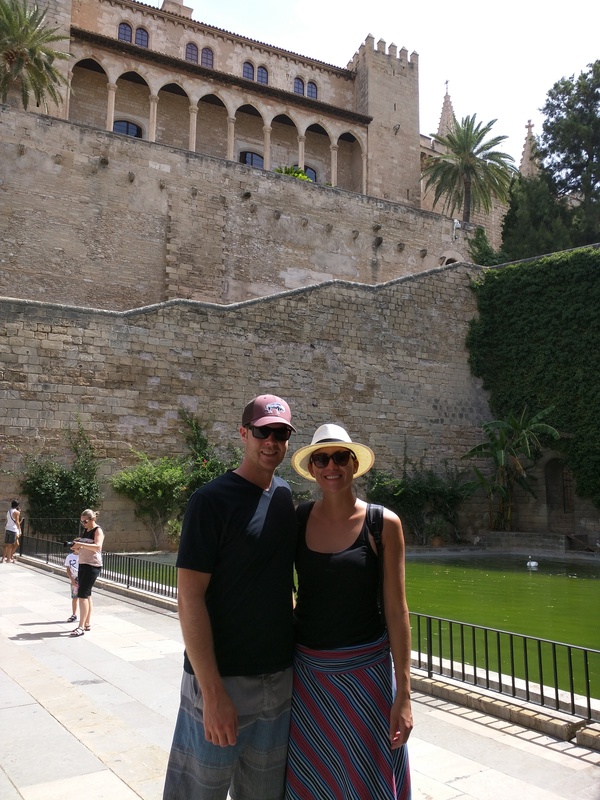 Mallorca is an island off the coast of Spain and we weren’t planning on going here but we are glad we had the opportunity to see this place! Mallorca is the larger and more calm sister island of Ibiza and is a huge vacation destination for europeans. The Mallorcan airport is the busiest in Spain and looks like it is a hub for Air Berlin (so many germans). It ended up only being $100 round trip to fly to Mallorca from Valencia so it was well worth it. Its also a hub for so many huge yachts. There was the 13th largest yacht parked in the harbor, Al Mirqab. You could see that gem parked in the harbor from the balcony of our hotel room. View from Hotel Balcony. Yachts for Days! We arrived Saturday evening and since we were in a clubbing paradise we decided we had to check out one of these clubs but first we had to get some dinner/nourishment so we could dance the night away. 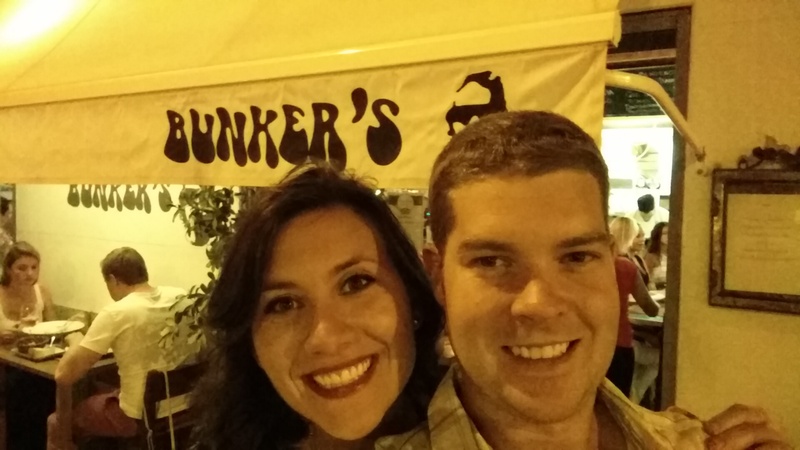 We ended up going to this Italian restaurant called Bunkers which was so tasty. Apparently there is a pretty large Italian presence on the island because during the spanish civil war the italians tried to move a bunch of italians to the island to take it over (they were not successful). I had the most amazing gnocchi at this restaurant..it was basically italian mac and cheese..yummmm. Bunker Selfie. Nom Noms italian food. After dinner we walked to the nightclub area which was packed and definitely felt like Las Vegas with people on the street trying to get you into their clubs. We finally settled on Blvd (or something like that..i honestly don’t remember..oops) and were like the first 10 people there. So again we were early to the party in Spain and that was at like 1am! The club finally started getting busy at like 3am..i don’t know how the Spanish can stay up so late! Either way we had a great time dancing and enjoying the night life! I would also like to point out that there are only english songs everywhere so even if you are at a club in Spain you will be listening to the same hits as in the US (so basically if you don’t speak english you have even less of an idea of what a song’s lyrics are than i do and that is saying something). 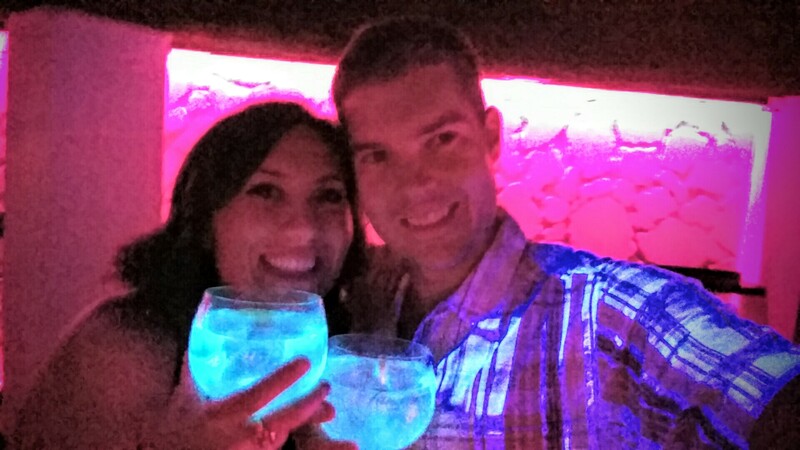 Also something to note..the Spanish love their Gin & Tonics and they serve them super strong and in giant globe glasses..and they glow in the dark! Glow in the dark G&T’s in the club. View from balcony. 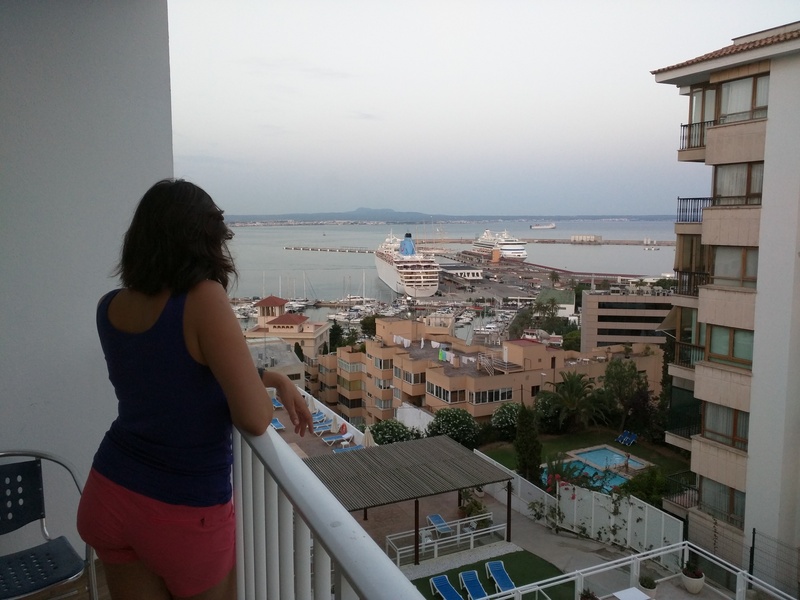 Mallorca is a great landing zone for cruise ships. Then we got to go scuba diving! Yea! The first dive was a wreck dive and Dan lost his buddy (me) and I lost my fins. It was dramatic and we will now refer to it as “the fincident”. There were four wrecks to check out and it was super cool because you could swim through the wrecks. The second dive was a cave dive and in one cave you were able to swim through a tunnel and the come up inside the cave! Super cool. We also saw sea stars, an octopus, and found a bicycle under water which one of the other divers proceeded to ride for most of the dive. After diving we went to a super cool beach bar in one of the coves that was right on the water. You could just sit, eat, drink and watch the huge yachts drive by. This was our kind of place. Now we just need to get a yacht. This night for dinner we ending up finding an asian restaurant that had an all you can eat buffet but instead of a buffet..it was a conveyor belt where you would just grab whatever you wanted so that was an interesting experience. We chose our selections carefully because you never know what you are going to get at an all you can eat, asian, conveyor belt restaurant. Look at that water! The beach bar is on the left, see the white tents. 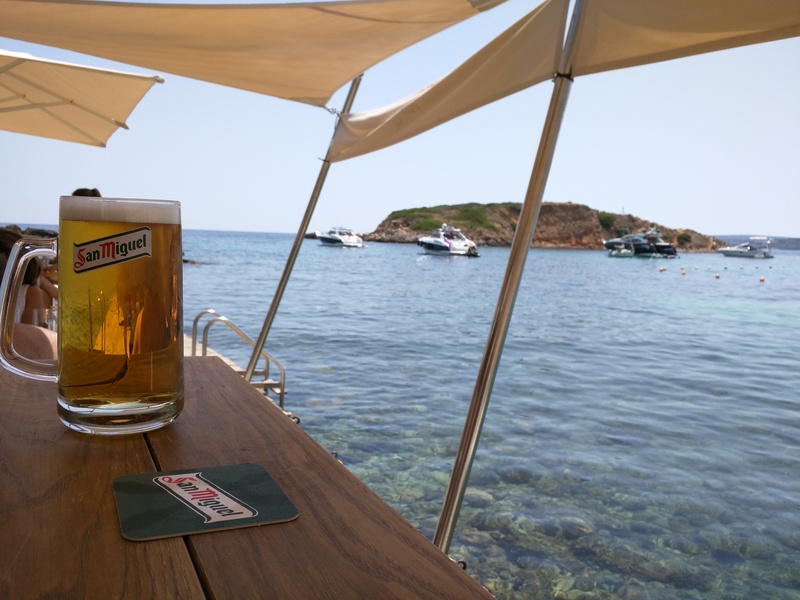 Beers and beach bar. Awesome view. Clear water. 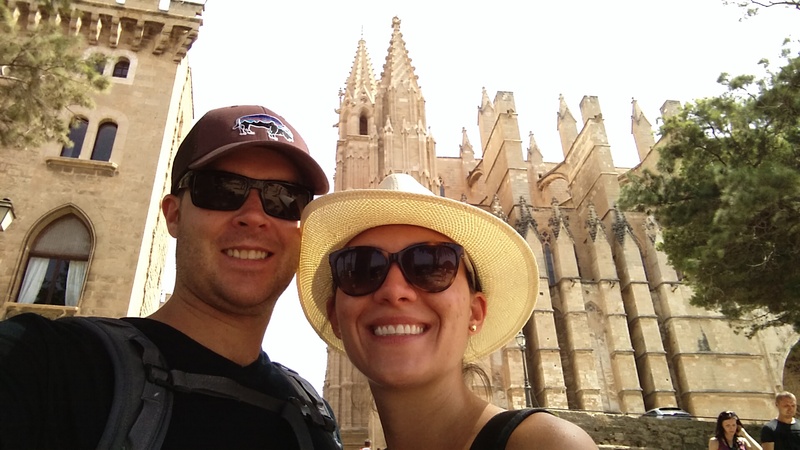 The last day in Mallorca we spent exploring the city center and the giant cathedral. We unfortunately didn’t have the time to go inside but maybe next time because we definitely would go back to Mallorca again! Cathedral. Someone else actually took our picture!